Current Essendon batsman Michael Hill scored his 5,000th career Premier 1st XI run last weekend in his innings of 51 against the reigning Premiers in Dandenong. 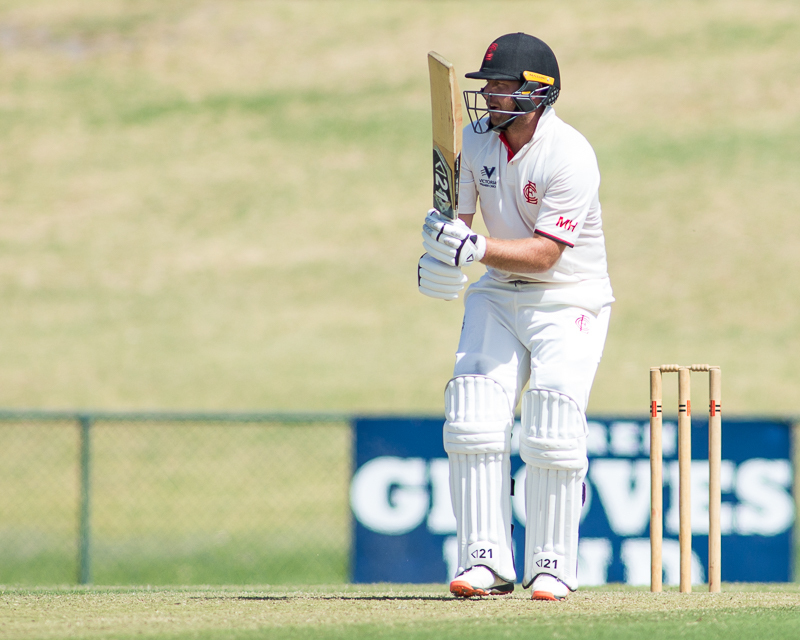 After a jam-packed weekend of Men’s Premier Cricket action last weekend, only two sides can carry a 3-0 win/loss ratio into the commencement of the two day matches for the season – St Kilda and Melbourne University. 9 separate batsmen were able to bring up a 3-figure score across the weekend (led by Tom Wood’s 141 on Sunday for Frankston Peninsula against Kingston Hawthorn and Ian Holland’s 140 for Ringwood against Greenvale Kangaroos on Saturday), while James Wilcock (Dandenong) took out the best bowling figures of the weekend with 5/28 against Northcote on Sunday. Both Wilcock and William Walker (Camberwell Magpies) took 8 wickets across the weekend’s action to head the bowlers’ charge. This weekend’s matches will be keenly anticipated by all players after dabbling with the white ball to start the season. After some wet weather during the week, bowling line-ups across each side will be hoping that their wickets have a little bit of moisture in them, while the batsmen will have their fingers crossed for good batting conditions on the first day. One of the key matches for Round 4 will be at Shepley Oval between Dandenong (5th) and Melbourne University (2nd). The Panthers’ are coming off a loss against Essendon and a 9-wicket win over Northcote, while the Students are looking confident after wins against neighbour Carlton and Melbourne last weekend. The home ground advantage may help the Panthers, while the Students will be hoping to see new recruit Alex Gregory fire with the bat after a quiet start on that front. At Princes Park #1, Carlton (7th) will host Essendon (4th) with both sides coming in on 2-1 records. The Blues dropped the game at home against Melbourne Uni on Saturday before rebounding with a win over Ringwood on the road on Sunday. The Bombers meanwhile have knocked off the reigning premiers Dandenong and Greenvale Kangaroos last weekend after dropping the opening round to Fitzroy Doncaster. The last time these two teams met was last season’s Qualifying Final and Carlton cashed in with the bat on that occasion, but it could be a different story this time around. Fitzroy Doncaster (6th) will host Footscray (12th) at Schramms Reserve, with the home side quickly looking to heal their wounds after a 5-run loss to Casey-South Melbourne on Sunday and get their bowling line-up to find that next gear, while the Bulldogs will be keen to get a prize scalp after a slow start to the year with their only points in the bank coming from last Sunday’s win over Prahran. The Lions are probably just showing a little more depth with the bat at present and appear in the box seat at first glance. The Monash Tigers (3rd) are clicking early in the season and will be looking for more points when they host Ringwood (10th) at Central Reserve North. The Tigers have started well with victories over the Camberwell Magpies and Footscray balanced by a close loss to Geelong on the road last Sunday. The Rams’ took the points against Greenvale last Saturday, but have come up short against Carlton and Dandenong in close games. While the Rams are starting to build a united team together, this will be a big test for their outfit against a side that is already hitting their straps this season. At AH Butler Oval, Frankston Peninsula (11th) will host ladder leaders St Kilda (1st). The Saints are coming off victories against Prahran, Geelong and Camberwell Magpies, while the Heat claimed the points against Kingston Hawthorn last Sunday. Tom Wood has already come out ‘all guns blazing’ to lead the competition run-scorers to this point for the Heat, but requires more support from his teammates, while the Saints are already making themselves known around the competition. The Saints favourites to remain unbeaten after this round. At Greenvale Reserve #1, the Greenvale Kangaroos (18th) will host the highway neighbours Geelong (9th) for the Peter Cox Shield. The Kangaroos have shown some positive signs of improvement under captain/coach Matthew Love with some good individual performances early, while the Cats will be looking to make their push up the ladder with a big performance on the road after a mixed bag last weekend (losing to St Kilda at the Junction Oval before winning at home against the Monash Tigers). Cats to start warm favourites (but will not want to let their guard down). Melbourne (13th) will play host at the Albert Ground to Casey-South Melbourne (8th), with both sides keen to secure some points in the longer format. The Dees claimed points with victory over Kingston Hawthorn, while have had close losses to Geelong and Melbourne Uni, while the Swans have defeated Frankston Peninsula and upset Fitzroy Doncaster, with new captain/coach Luke Wells settling in with the bat. If the Swans’ bowling attack can make early inroads into the Dees batting line-up then they are in with a genuine chance of taking the points. At Bill Lawry Oval, Northcote (14th) will host the Camberwell Magpies (16th). The Dragons tasted success against Kingston Hawthorn but have lost to both of the reigning Grand Finalists in Fitzroy Doncaster and Dandenong last weekend, while the Magpies have taken the points against Frankston Peninsula but struggled against the Monash Tigers and came up short against St Kilda. The Dragons’ need to find someone to stand up with the red ball and take wickets, while the Magpies need a couple of big scores with the bat to back their bowlers up. An interesting contest awaits. Finally, Prahran (15th) will host Kingston Hawthorn (17th) at Toorak Park. The True Blues have seen a mixed bag in results with a win over Casey-South Melbourne but losses to St Kilda and Footscray, while the Hawks have dropped all 3 matches so far (to Northcote, Melbourne and Frankston Peninsula). The last time these sides met saw a remarkable 24 wickets fall on day 1 and an Outright win to the Hawks, but the read on the early results this season indicates it could be down to which side can bat better in this match. An all-round performance from Amy Yates (Melbourne) with 55 and 4/39 helped the Demons to secure the points against EMP. This week’s action sees a round that mirrors the current ladder positions. Prahran (1st) will play the up-and-coming Carlton-Brunswick (2nd) at Toorak Park with the winner to remain unbeaten. This will be a good test for the Strikers to see where they sit against a quality team and how much support can be found for Ellie Mason with the bat against a quality line-up with Emma Inglis, Alana King, Jess Duffin and Annabel Sutherland all showing strong early-season form for the True Blues. Prahran to be too strong at home. Plenty Valley (3rd) have shown some strong early season form be defeating both of last season’s Grand Finalists and will have Melbourne (4th) in their sights this week on the road at the Albert Ground to look to make it 3 from 3. 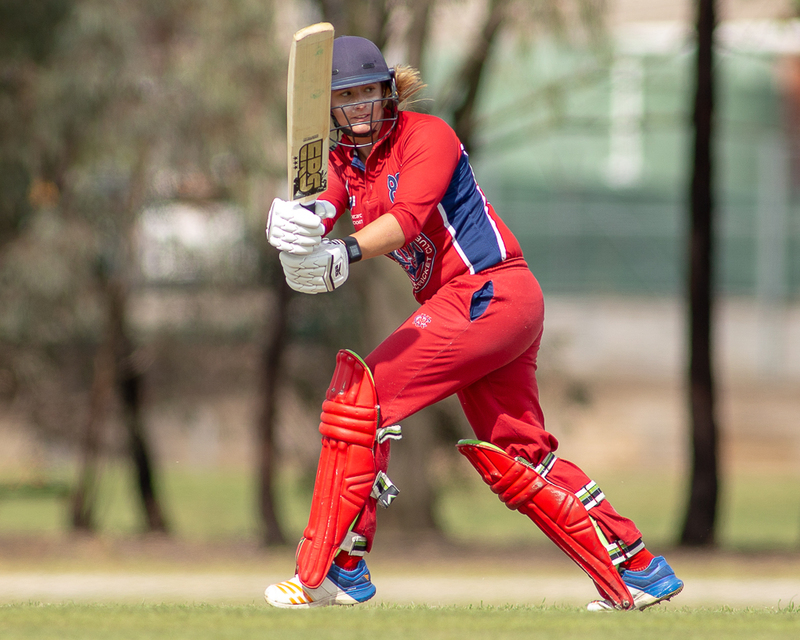 Plenty Valley has clicked with two ‘team effort’ performances to get the points, while Melbourne come off a successful run chase against EMP last weekend and will be keen to get another scalp to build their charge up the ladder. This game could easily be the one that will go either way, but gut feel says Melbourne at home in a close one. The Grand Final rematch will see Box Hill (5th) host an Essendon Maribyrnong Park (6th) side that has been decimated by players away on Australian representative duties at Box Hill City Oval. Box Hill took the points in Round 1 against Melbourne before stumbling to Plenty Valley last week, while EMP have dropped both games to Plenty Valley and Melbourne. Just how much the loss of Elyse Villani, Georgia Wareham and Molly Strano to Australian representative duties will impact the Bombers this week is anyone’s guess. A real ‘toss of the coin’ game this one to either make or break someone’s season. Finally, newcomers Ringwood (7th) will travel down to Shepley Oval to take on fellow winless side Dandenong (8th) to see who will claim their first points of the season. Both sides have faced the current top 2 teams this season and will be looking forward to this opportunity to secure some points. While the Rams will certainly be happy to get some early season nerves out of the system, I think that Dandenong’s experience with the ball may just be enough of a difference with this match with skipper Emma Gallagher and Chelsea Moscript leading the Panthers’ attack. Umpire George Vajda (1st XI Cap #521) will umpire his 250th match of Victorian Premier Cricket this round at the Plenty Valley vs Melbourne Women’s 2nd XI match at Yarrambat. Umpire James Watson (1st XI Cap #533) will umpire his 200th match of Victorian Premier Cricket this round at the St Kilda vs Frankston Peninsula 2nd XI match at Harry Trott Oval. Umpire John Walker (1st XI Cap #532) umpired his 150th match of Victorian Premier Cricket last weekend at the Melbourne University vs Carlton 2nd XI match last Saturday. Dean Russ (Footscray) scored his 7,000th career 1st XI run during his innings of 105 against Prahran last Sunday. Michael Hill (Essendon) scored his 5,000th career 1st XI run during his innings of 51 against Dandenong last Saturday. Evan Gulbis (Carlton) scored his 5,000th career 1st XI run during his innings of 33 against Melbourne University last Saturday. 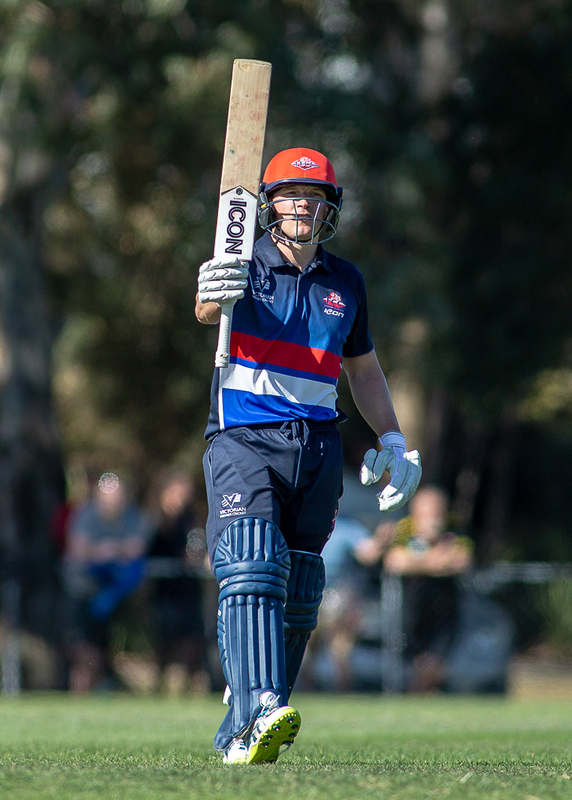 Dylan Kight (Footscray) scored his 4,000th career 1st XI run during his innings of 71 against Monash Tigers last Saturday. Matthew Brown (Melbourne) scored his 4,000th career 1st XI run during his innings of 52 against Melbourne University last Sunday. Jackson Freeman (Ringwood) scored his 1,000th career 1st XI run during his innings of 23 against Carlton last Sunday. William Walker (Camberwell Magpies) took his 200th career 1st XI wicket when he dismissed Ben Davies (St Kilda) on Sunday. Nicholas Boland (Frankston Peninsula) took his 50th career 1st XI wicket when he dismissed Akshay Kodoth (Kingston Hawthorn) on Sunday. Henry Hall (St Kilda) took his 50th career 1st XI wicket when he dismissed Josh McDonald (Geelong) on Saturday. Shea Gribben (St Kilda) took his 50th career 1st XI wicket when he dismissed William Walker (Camberwell Magpies) on Sunday. Robert Salerni (Frankston Peninsula) took his 50th career catch when he caught Shorye Chopra (Kingston Hawthorn) off the bowling of Brodie Symons.